So quiet, they silence the competition. The comfort of an environment is primarily determined by the sense of touch, sight and sound. Even when humans were dwelling in caves, sound control was a critical component towards making the environment hospitable, and was done successfully through the use of animal hides and plant materials including foliage and moss matting. Although the materials and methods used to control the acoustics within an environment have advanced, the basic principle of sound absorption has not changed — converting sound energy into heat energy. Acoustical materials are usually constructed of soft, pliable, porous materials, and visual aesthetics are secondary to sound absorption ability. Typically, the appearance of acoustic absorbing materials within architectural and public spaces is difficult to disguise, and is either displayed openly, such as acoustic ceiling panels or sprayed cellulose acoustical insulation, or concealed behind fabric. Since the late 1970s, a promising new approach to sound absorption has emerged, centered around the use of small holes. These holes are referred to as “micro-perforations” and are punched or cut into and extend through the surface of a panel. The diameter of the micro-perforations are typically .5mm-.9mm, and are numerous — up to 30,000 per square foot (300,000/m2). From appearances, micro-perforations wouldn’t appear to have much, if any, effect on the acoustical properties of a panel. In reality, the effect is profound. To understand how micro-perforations absorb sound, it helps to understand the structure and behavior of a sound wave. A sound wave traveling through air consists of 2 “half-cycles”. The first half-cycle consists of energy in the form of compressed air generated from the vibration of an external source (i.e., speakers, vocal cords, hand clap). The displacement of air produced by the first half-cycle creates the second half-cycle, consisting of an equally proportionate area of less dense, or “rarified” air. The speed that sound waves travel through air is fairly constant — approximately one mile in 5 seconds. The number of waves, or frequency, that occur within a given amount of time varies significantly. “Hertz” is the term used to measure the frequency of sound waves occurring per second. 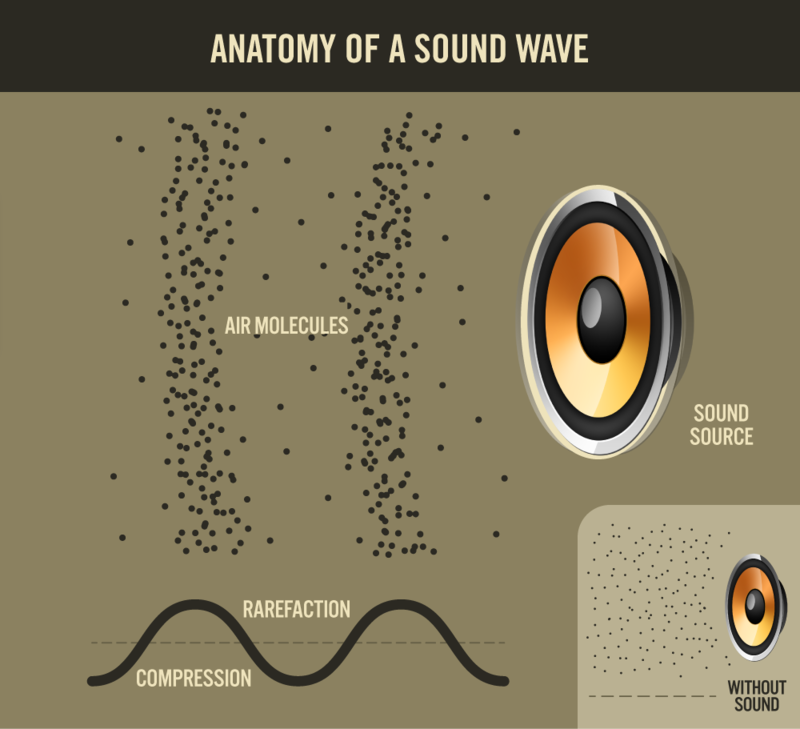 When a sound wave hits a hard surface, the air between the surface and the wave compresses, storing the energy of the sound wave’s first half-cycle. As the sound wave progresses into the second half-cycle, the compressed air expands away from the hard surface, efficiently reflecting the energy, continuing the sound wave’s movement with minimal energy loss. With the addition of micro-perforations to a hard surface, the entire process changes significantly. Micro-perforations act as escape ports for the compressed air. When a sound wave compresses air against a micro-perforated surface, the air reaches a point where it’s easier for it to enter the perforations than to continue compressing. As the compressed air travels across the surface and into the micro-perforations, surface friction occurs between the solid surface and the boundary layer of air molecules. This friction converts the compressed molecules’s energy into surface heat which immediately dissipates into the surface and surrounding air. During the sound wave’s second half-cycle, the air molecules reverse direction due to a switch in pressure. The air travels back through the micro-perforations expelling outwards, like a geyser, into the oncoming sound wave. Studies have demonstrated that additional sound absorption is created by fluid friction converting sound energy into heat, which takes place during the second half-cycle. Fluid friction occurs when ejected air molecules and the compressed air molecules of the approaching sound wave collide. Depending on the quality and dimensions of the micro-perforation, the fluid friction can deplete a significant amount of energy from the sound wave. There are several reasons why our SoundPly panels hold the highest NRC ratings of any acoustical wood panels, and they start with our development of the perfect micro-perforation. The benefits of our proprietary broach pin punch process include clean, sharp holes, helping to to avoid the "punch craters", veneer tear-out, and rounded, light-reflecting edges synonymous with other manufacturing methods. The manufacturing methods and range of quality vary drastically between the global manufacturers of micro-perforated acoustic panels. 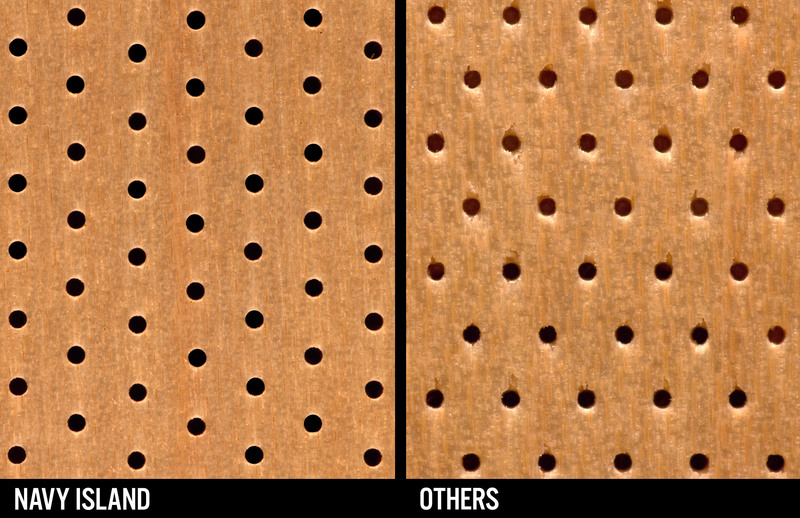 On the surface, micro-perforated panels may appear similar, but measurable and significant differences become immediately evident when comparing the acoustical performance between various manufacturers' micro-perforated panels. There are 2 primary factors which determine the sound absorbing ability of a micro-perforation — the micro-perforation's dimensions and the micro-perforation's construction quality. The dimensions of an acoustic panel's micro-perforations are what determine much of the panel's sound absorption. The diameter of a micro-perforation determines the frequency width of sound adsorption, while the depth of a micro-perforation helps determine at which frequency location the sound absorption occurs — shallow micro-perforations absorbing higher frequencies, deeper ones absorbing lower frequencies. Because of this, we've invested signification time and energy into "tuning" our micro-perforations to achieve the broadest range of sound absorption across the most relevant frequencies. We've discovered that the ideal micro-perforation diameter is between .55-.45mm, with the ideal depth between 1.7 - 2.0mm. The image above is an actual cross-section of the micro-perforated skin of Navy Island’s SoundPly, compared to the micro-perforated skin of a leading competitor. Each digitized cross section was modeled in a computer generated physics engine to show how a sound wave behaves at 2000hz. (see video below) The performance of the Navy Island perforated surface is much more effective at absorbing and interrupting subsequent sound waves. 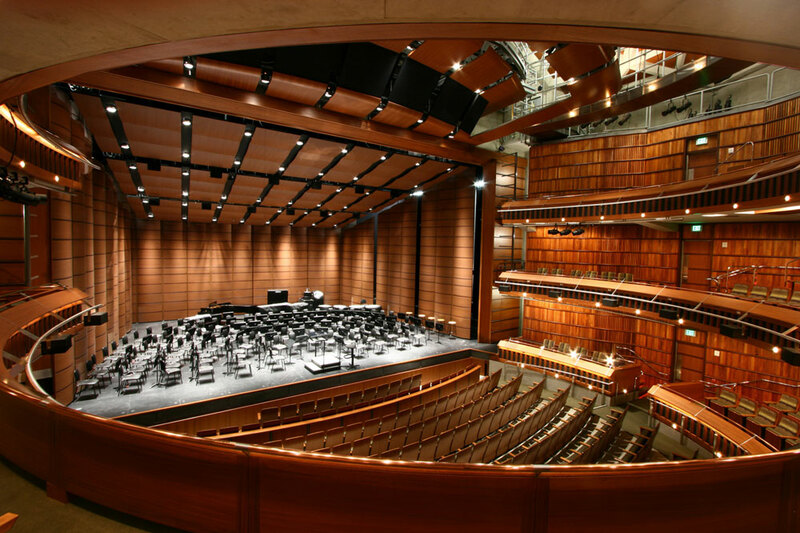 A typical acoustical panel installation can represent tens of millions —even hundreds of millions— of micro-perforations, and even if just 5% of those perforations are partially-plugged, tapered, or simply have rough walls, there is a measurable reduction of sound absorption. We've developed a manufacturing process which uses a sequence of broach pins to create and refine each micro-perforation. This proprietary process results in the cleanest, sharpest perforations possible, while allowing for perforation depths that are 2-3 times deeper than what other manufacturers can produce. No other company has invested more resources into researching the science of micro-perforations than Navy Island. Equal amounts of energy have been invested into engineering a manufacturing process able to produce a micro-perforated panel with acoustical properties that have, until now, been limited to research laboratories. A significant, often overlooked cost with acoustic panel projects is the expense of fabricating and installing the panel's supporting fixtures. Installing acoustic architectural panels is significantly more complex than installing traditional architectural panels — a non-acoustic panel job that could be installed in hours, may take days to install as acoustic panels. Navy Island's SoundPly panels are different. SoundPly panels can be installed like traditional, non-acoustic panels. Everything from cutting-to-size, edgebanding, and mounting of SoundPly panels is straight-forward and can be processed using the same equipment and methods as non-acoustic panels. In fact, due to the light weight of SoundPly panel's (significantly lighter than MDF or Particleboard), they're typically easier to handle, transport and hang than any other kind panel — acoustic or non-acoustic. From conference rooms to cathedrals, amphitheaters to automobiles, the ability to control sound is always an important factor in determining an environment's comfort and usability. In many areas, such as airports and factories, the danger of prolonged exposure to loud noises is obvious. What hasn't always been as apparent are the benefits of sound control within less extreme environments. Several recent studies have shown a strong, positive links between the acoustic comfort of an environment and the behavior of students, employees and customers. The majority of architectural acoustic products are primitively engineered for an indiscriminate reduction of noise. Whether the sounds's volume is at 5 decibels or 100 decibels a similar percentage of the sound's energy is absorbed by the material. For architectural applications, this is usually not desired, since quieter, ambient noises are too easily absorbed, while loud, abrasive noises are not absorbed enough. 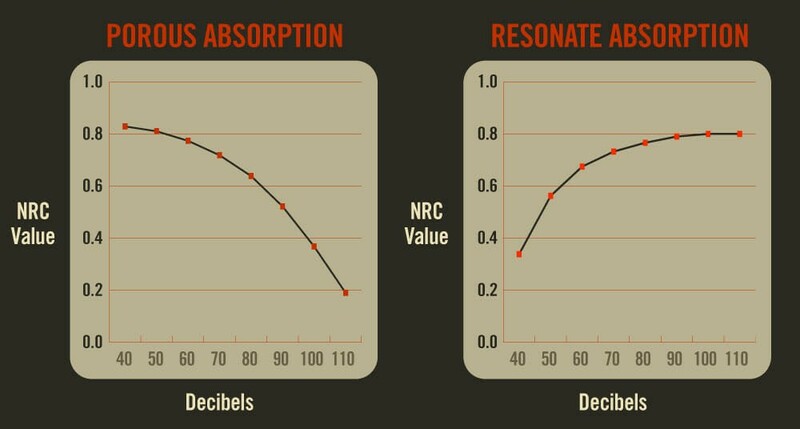 To address this issue, acoustic products have been developed with frequency-specific acoustic leveling properties. These products are designed to absorb sound within specific frequency ranges, and are best suited for applications where undesirable sounds are at a frequency that can be isolated from other sounds. Examples of this include environments that are exposed to motor/engine hums, sirens, alarms, horns, and construction equipment. Both of these types of products are suitable for many applications, although their success depends heavily on precise, and often costly acoustic engineering. Additionally, some of the most effective acoustic materials are visually distinct, often compromising the intended aesthetics of an environment. Recently, a third option has emerged with the development of micro perforated panels or MPPs. In laboratories and universities, MPPs have not only exhibited exceptional sound absorption properties, but have shown to display non-linear sound absorption, or threshold-specific acoustic leveling properties. At the lowest sound levels, a micro-perforated panel absorbs the smallest percentage of acoustical energy. This is because the sound wave's energy is below the critical threshold to propagate the evacuation and resonance of air through the panel's micro-perforations. This threshold is determined by several variables including the size, pattern, spacing, depth and shape of the micro perforation, but is usually under 50 decibels. At medium sound levels (50-80 decibels), sufficient energy exists to sustain air resonance within the micro-perforations. In this volume range, primary sound absorption occurs from acoustical energy losses through thermal and viscous friction. This jetting effect occurs on both sides of the micro-perforation, and significantly disrupts the uniformity of succeeding sound waves. At high sound levels (over 80 decibels), an additional effect, called jetting, becomes the dominate method of energy absorption. Air molecules are unorganized when they enter a micro-perforation, but as they flow through the perforation, the friction between the air and the perforation’s walls organize the molecules into donut-shaped rotating vortices. Due to the high level of acoustic energy contained in the vortices, they continue rotating upon exiting the perforation, and can travel a significant distance. SoundPly panels are available with kerfed (slotted) backs, allowing them to curve to radiuses as small as 8”, while still maintaining their structural integrity and superior sound absorption. Additionally, the unique thickness of SoundPly’s perforated face material minimizes the faceting common with kerfed core material. SoundPly panel’s light weight allows for quick installation, while requiring less support to suspend a fixture. SoundPly’s exceptional rigidity also means that minimal structural bracing is required to prevent the sagging synonymous with acoustic panels using MDF and particleboard cores. With SoundPly panels there is no exposed insulation backfill, allowing for cleaner aesthetics and minimal maintenance. SoundPly panels are lightweight, rigid, and impact-resistant, making them ideal for use as furniture components in everything from door fronts to demountable walls. SoundPly panels can be easily cut to size, edgebanded, and mounted with a wide range of hardware. SoundPly panels are significantly lighter than solid wood or veneered MDF / Particleboard panels, and no place is this advantage better realized than in ceiling applications. 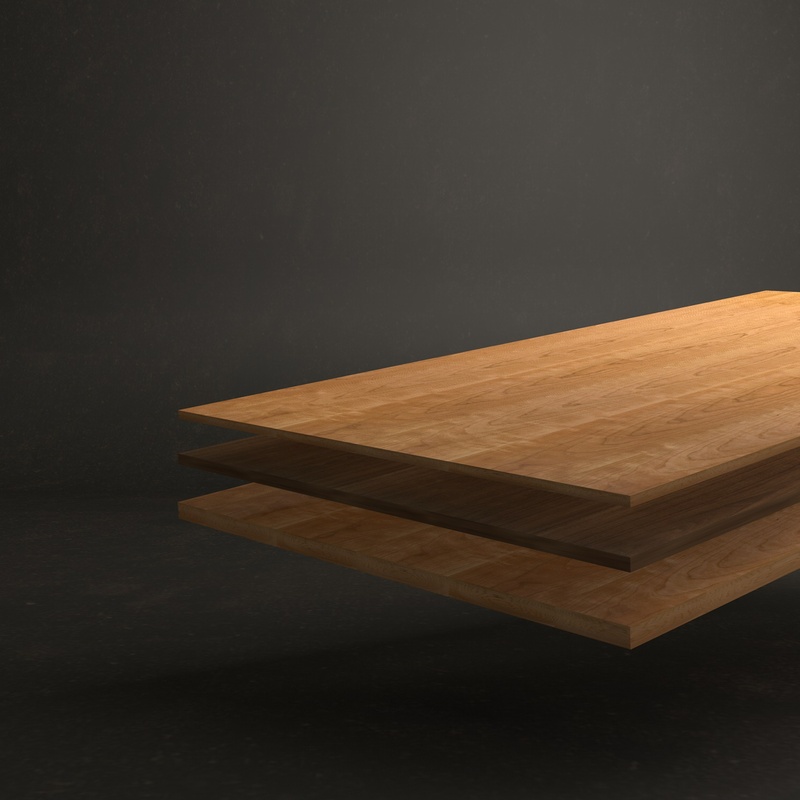 SoundPly’s lighter weight not only provides for a quicker, less expensive installation, they require less mounting hardware and structural reinforcement than any other type of wood panel- acoustic or non-acoustic. SoundPly panels are the only micro-perforated panels that can be easily hung on the wall using standard z-clip, similar to traditional wall panels. Unlike other micro-perforated panels, they require no additional layer of acoustic material and cavity space to achieve their documented NRC ratings. By reducing a 5” thick wall fixture into a 1” thick panel allows SoundPly panels to be a viable option in environments where maximizing useable square footage is essential, or where concrete walls (or the existing structure) prevents hollowing out walls to create acoustic cavities between the studs. Many acousticians strongly recommend against using movable partitions in an environment — not because of concerns over sound transmission between environments — but because of the poor acoustics they introduce within an environment. 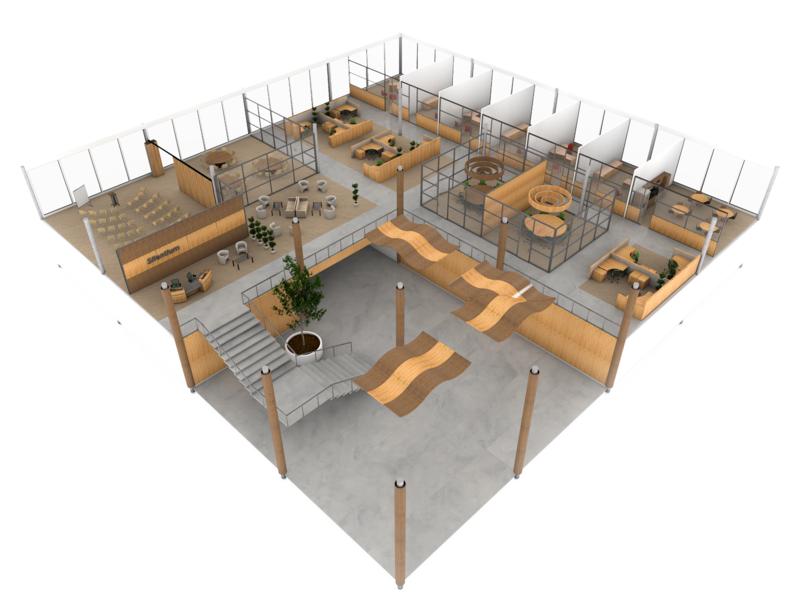 SoundPly panels will completely eliminate the excessive reverb associated with movable partitions, drastically improving the speech audibility and acoustic comfort within the partitioned environment.